While Trang An, Tam Coc - Bich Dong are the destinations which have been familiar, Thung Nham still seems to be a relatively unfamiliar name with visitors to Ninh Binh. However, if you love the natural beauty of the two landscapes known as the "Ha Long Bay on land" of the ancient capital, surely, the poetic beauty of Thung Nham will not make you disappointed. 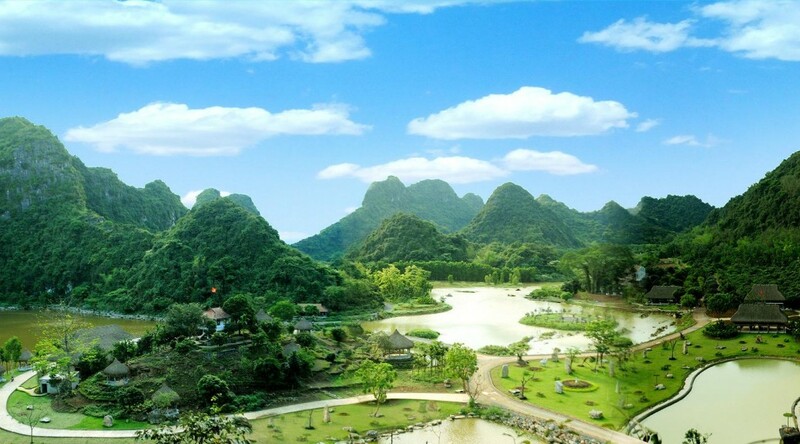 Located in Ninh Hai Commune, Hoa Lu District, Ninh Binh, Thung Nham is situated in the core area of the entire population of Trang An landscape, near the famous tourist resort of Tam Coc - Bich Dong. 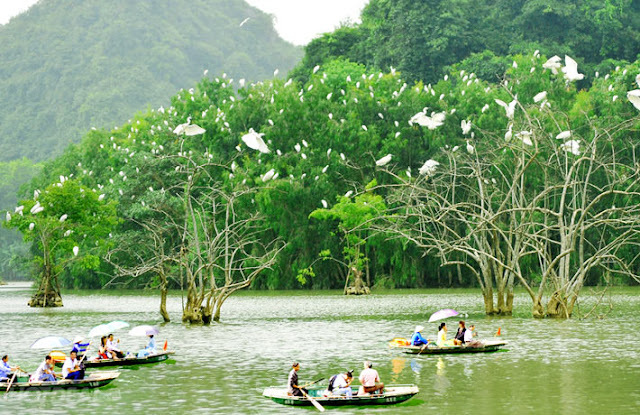 To come here, tourists usually pass Tam Coc tourism area approximately 4 kilometers, through Thung Nang, then continue the journey by road or by boat if you want to have a look at Hang Pagoda. The first impression visitors get when setting foot on Thung Nham is an area of blended mountains, water and clouds. Thung Nham is surrounded by limestone mountains covered with green color of the strip of rainforest. In the early morning of spring days, the fog when the sun has not been shined gives Thung Nham a magical beauty, a glamor as it is the fairy land. Perhaps the typical feature of Ninh Binh tourism is the peaceful setting of the boats taking tourists to visit the landscapes, and Thung Nham is not an exception. 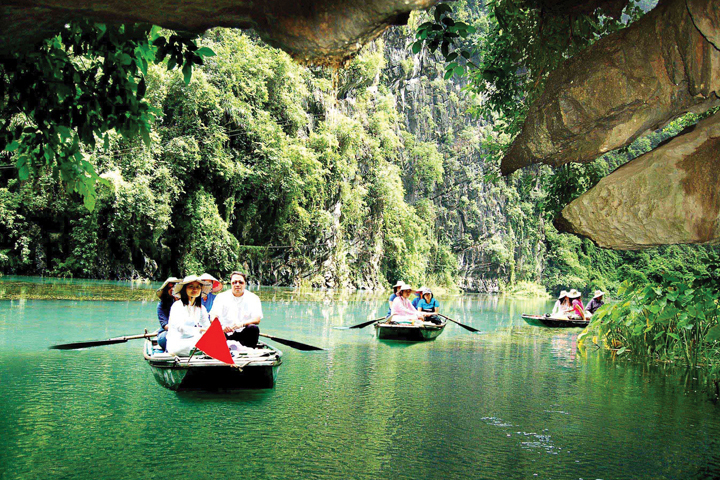 On the blue waters surrounding the limestone foothills, small boats will take you to stroll in the land of the birds. You'll be sure to see countless species of birds here, the most common ones are stork, cauldron, heron, teal, white-rumped shama, starling... In particular, it is also home to many rare birds listed in the Red Book. 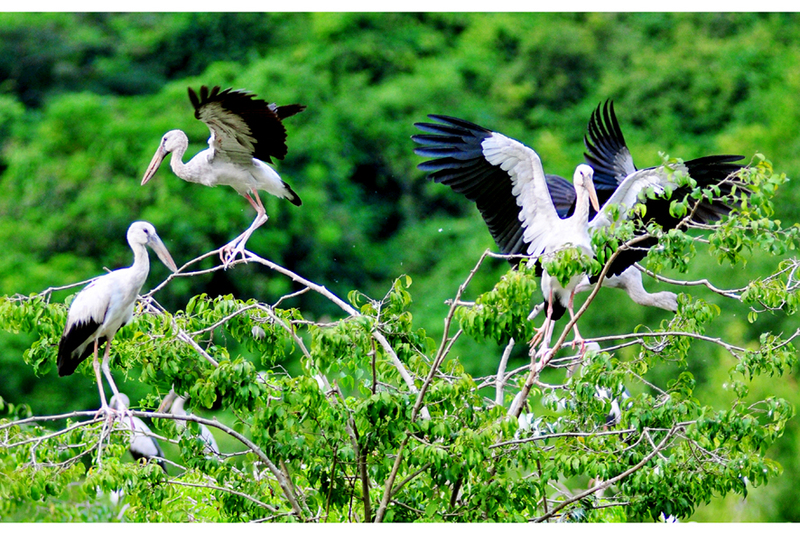 They perch on the branches closed overhead, sometimes, they twitter and joke, and sometimes they fly as they dancing to attract tourists. In the quiet space, there is only the sound of brandishing oars and the echoes from the cliffs of people sitting on the boat talking, the sound of chirping birds… all of them blend and are like a symphony of boisterous nature. Because the twilight is the time when the birds return to their nest after going to find food, to witness the scene of thousands of birds flying back and perching on the wetlands, instead of staying up late in the afternoon, visitors can choose to go in the autumn because the weather is chilly, the birds will find the food in nearer area and return to their nest more early. Not only can visitors discover interesting things about wildlife of birds, when sitting on the small boats going into flooded forests, visitors also enjoy the wonderful pristine beauty which is hard to find in any other elsewhere apart from Thung Nham. After satisfying your eyes, you can visit the caves in the rocky mountain such as Vai Gioi cave, But (the Buddha) Cave, Tien Ca (Mermaid) Cave, Thuy Cung (The Aquarium) cave, Ba Co (Three Fairies) cave. Leaving the boat to stroll on the shore, visitors will come to the orchard, visit the millennia streblus, centuries-old banyan tree, primeval forest, aquaculture zones. This is also an ideal area for hiking, camping, weekend vacation with many entertainment activities such as fishing, campfire, cultural exchange. Thung Nham is suitable for trips of one to two days. If you intend to stay overnight, you can stay in the stilt houses in the valley which is as beautiful as the fairy land and enjoy the rustic cuisine, such as pigs, chicken raised in the hills, fish in the lake, cane shoots, wild vegetables, and relax in the quiet, peaceful space in Thung Nham.